Mrs. Ify Onyegbule Anderson, a renowned broadcaster and publisher, Woman of Substance, has sent a Save Our Soul (SOS) message to public-spirited individuals to help save her husband, George, from chronic kidney disease. Anderson, who is Team Lead, Truespeak Broadcast Academy, said her husband who fell ill in September was rushed to the hospital where he was diagnosed with kidney failure. Thereafter doctors recommended three sessions of dialyses every week to help filter his blood and stabilise organ functions. Every session costs over N40,000 without the tests and other organ function examinations. In her passionate message, Anderson graphically describes her pain and fears. “Every day, at the hospital is a very emotional and disturbing experience, I watch my husband, daily and slowly slipping into pains from these diseases. My heart aches. My tears won’t dry. My husband is weaker at each sunrise and slower at sunset. 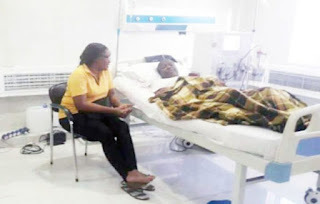 A medical report signed by the Consultant Physician and Nephrologist, Althahaus Medicals, Dr. PC Emem-Chioma, noted that George is long term hypertensive, being managed for End Stage Kidney Disease and Rheumatoid Arthritis. According to the report, George requires urgent kidney transplant. His condition requires repeated electrolyte, urea, creatinine and Full Blood Count Evaluations as well as three haemodialysis per week for him to be relatively stable while awaiting kidney transplantation. He also requires monthly shots of erythropoietin. The treatment, surgery including post-surgery care and support are estimated to cost N15 million. “Where am I going to get that from? She asks, rhetorically. “Time is not on my side. I need your help here and now. Our income cannot meet the financial burden of his medical challenges as he is unable to walk and work due to this illness and I have put a temporary hold on my work to care for and support him. “I need you to help me save my husband. I do not want to be a widow at the prime of my life. I do not want to lose him to this dreadful disease because of our financial status that has been whittled down due to this challenge. “Hence I cry to you to please help me with whatever you have. Your donations will help me save my dearest husband and a wonderful father. He is my life and I don’t want to lose my life. If you are touched and wish to help save George, kindly send your donations to Ify Onyegbule, Zenith Bank, 1002133134 or call 08026265478 for further details.